Pax Christi International rejoices with the beatification of Archbishop Oscar Arnulfo Romero and celebrates in solidarity with the people of El Salvador and the peoples of the world who recognize in Msgr. Romero a witness of a peace which is the fruit of justice. Msgr. Romero’s legacy is the persistent search for truth, justice and reconciliation; his journey was marked by a unique coherence between his values and faith and his practice. While Msgr. 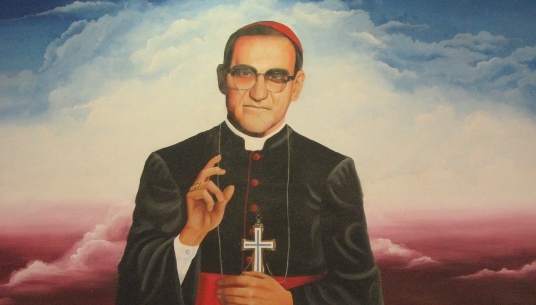 Romero was leading the Archdiocese of San Salvador, the political repression of the popular demands for justice and human rights reached brutal levels of violence. In facing that reality, he became a true prophet. His word and his pastoral practice – based in the Gospel – denounced the structural injustice at the roots of the repression and proclaimed the centrality of justice and the unconditional respect for human rights as the only way to leave behind the spiral of violence in which El Salvador was immersed. He tirelessly defended those whose rights were persistently violated and built bridges among those who looked for a just transformation of the conflict. But his voice was not heard by those who clung to their own power and interests, and they ordered his assassination while he was celebrating the Eucharist. Click here to read more of this statement.